I saw this glass dispenser at Marshalls about a month ago. I had it in my cart and when I got to the check stand I changed my mind. It was $49.99 and I decided I shouldn't be spending that much money. Someone else must have bought it because the next time I went in, it was gone. Of course, later I regretted not buying it. I went back into Marshalls last week (I'm addicted to that place) and saw they had a new one in. The best part....it was $10 less than before....only $39.99! I figured it was just meant to be! Now the bad part. I brought it home and washed it and as I was tilting it in the sink I hit the pedestal on the tile and a piece broke off! You can see it in the photo below. I just have the piece sitting there, I still need to glue it together. Anyone know a good glue to use on glass? Saturday was a great day for lemonade. It was so hot, in the 90s. Way too hot for me! I hope you all had a great weekend. Did you hear the great new about Victoria Magazine? If not, go over to visit Carol at Raised in Cotton, (one of my new favorite blogs) to hear some great news! Thank you, thank you, thank you for sharing the good news about Victoria magazine. I am also ever so grateful for your introduction to the Raised in Cotton blog. Another kindred spirit. More eye candy. Keep it coming, you're the best! Cindy, that's a gorgeous glass container & I can see why you fell in love with it. I think you can glue that piece back on with some clear craft glue & it shouldn't be too noticable. I am so glad I visited your site before I purchased one from TouchStone for $50.00 - I'm headed to Marshall's. I love Marshall's too! I would have bought that container as well. I got the news release through google alert the same day it was announced and I've been goofy happy about it ever since. I am looking forward to this soooo much. Thanks for the info on the magazine. I've never seen the magazine but I love the books put out by them! Can't wait to see the first issue in November. Thanks for the news about Victoria. I never could understand why it folded in the first place. That's a beautiful container - gotta luv Marshall's & TJ Maxx! Oh, Cindy - that looks just like you. I'm happy it found its way home to you!! Pretty container! Hot here too...by June I'll be melting. Great news about Victoria! I wonder if the new version will be like the original magazine or if it'll be like the version they had right before it went out of print. 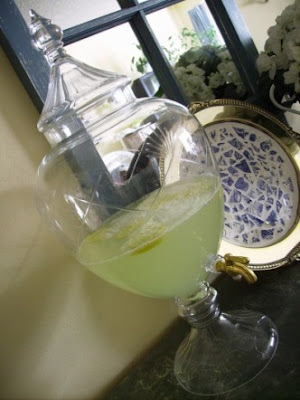 Love the glass container, it is wonderful. Even more wonderful is the news about the return of "Victoria"! I can't wait!Thanks for the info Cindy! i love the glass container, its so pretty...I am so happy about Victoria coming back..i love that mag..
Cindy; The most reliable glue to use on glass/glass seams is a UV curing glue. I purchase mine from Sundance Art Glass in CA, it's called KOA something. Superglue also has a version which cures in sunlight (otherwise you have to use a black light). 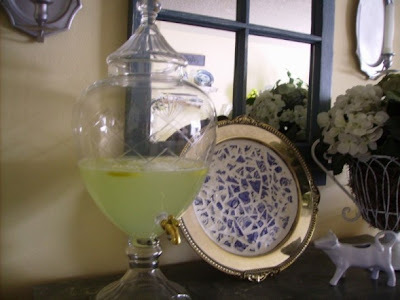 I hope it works for you, that's a mightly pretty lemonade container! Thank you forthe news regarding Victoria Magazine. I had a subscription from the start previously. Loved it. Will probably love it again. Cindy, save yourself lots of work... just sand the table alil bit, prime then paint then shabby it here and there! NO NEED to strip it if you are painting it anyways! I am jealous...my roses are just now showing some green! Thank you for shareing your pretties with us all! I have had my eye on that same jar, and I just haven't been able to buy it yet. It kills me to walk past it. Looks great with lemonade! I am SO excited to hear about Victoria Magazine!!! I was sad when I learned that it was going out of print. If they would let me put in a subscription now, I would!